The Liberty Flames scored 18 runs over the final four innings, overwhelming the Longwood Lancers, 20-7, Friday night at Charles “Buddy” Bolding Stadium. After trailing 6-2, Liberty outscored Longwood, 18-1 from the sixth inning on in the victory. Liberty plated two runs in the sixth and tied the contest with three in the seventh, before shocking the Lancers by scoring seven runs with two outs and no one on in the eighth to take the lead for good. The Flames then capped the night with six more in the ninth. With the win in the first game of the Big South three-game series, Liberty moves to 10-6 in conference and 24-15 overall. Longwood falls to 5-11 in Big South play and 13-27 overall. First baseman Sammy Taormina collected a career-high six RBI with three hits, two home runs and three walks. He belted his ninth and 10th home runs of the season and recorded his third two home run game of the year. Reigning Big South Player of the Week D.J. Artis reached base six times. The Flames center fielder went 3-fo-4, walked twice and was hit by a pitch. He had three RBI and score four runs. Third baseman Trey McDyre had a contest-high four hits with a RBI and two runs scored, while outfielder Jack Morris hit his second home run of the season in the victory. 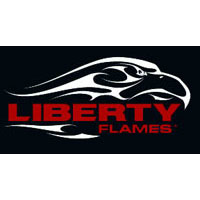 Liberty got off to a fast start with two runs in the first, thanks to Taormina. Artis, who leads the Big South in walks, led off the game with a base on balls. After the next two Flames were retired, Taomina belted the first pitch he saw over the right field wall for a 2-0 edge. Longwood batted around in the bottom of the fourth, scoring five runs on six hits to take a four-run lead. Shortstop Michael Osinski and first baseman Justin Mitchell opened the inning with back-to-back singles. Two batters later, an infield single by designated hitter Nate Blakeney plated Osinski with the first run of the inning. Catcher Mac McCafferty followed with a RBI single to knot the game at 2-2. After a single by second baseman Brandon Harvell, right fielder Ryan Shull singled to give the Lancers a 3-2 advantage. Left fielder Antwaun Tucker then drew a two-out walk with the bases loaded to force in another run for a 4-2 lead. A bases loaded error by Liberty third baseman McDyre and a passed ball, both with the bases loaded, allowed the Lancers to build a 6-2 advantage. Benefitting from two Longwood errors, the Flames sliced their deficit in half in the top of the sixth. With one out, shortstop Cam Locklear singled and Artis walked. Both runners then executed a double steal, and when Lancer catcher McCafferty’s throw sailed into left field, Locklear scored to make it, 6-3. Two batters later, Liberty plated another run, when Longwood second baseman Harvell made an errant throw to first on a ground ball by Taormina, cutting the Flames’ deficit to 6-4. Liberty pushed three runs across in the top of the seventh on one hit. Designated hitter Eric Grabowski walked to lead off the inning and moved to second on a one-out walk to catcher Payton Scarbrough. After Locklear was hit by a pitch to load the bases, Artis was hit by a pitch to force in the first run of the frame. McDyre followed with a run-scoring single to tie the game at 6-6. Two batters later, Taormina walked with the bases full to give the Flames a 7-6 edge. Longwood answered in the home half of the seventh. A two-out single by Harvell scored Blakeney, who had walked earlier in the frame, deadlocking the contest at 7-7. Liberty struck for seven two-out runs in the eighth to take the lead and break the game wide open. With two away, Scarbrough battled back from a 0-2 count to draw a base on balls. Pinch runner Jonathan Embry then moved to third on a single by Locklear. Artis followed with liner back through the middle of the diamond, plating both runners for a 9-7 edge. After left fielder Jake Barbee walked to load the bases, Taormina and second baseman Andrew Kowalo drew back-to-back walks to extend Liberty’s advantage to 11-7. Grabowski, who led off the inning, followed with a bases-clearing double to give the Flames a 14-7 lead. Liberty added six runs in the ninth. The Flames plated a run on a wild pitch, a three-run home run by Taormina and a two-run home run by Morris. Flames reliever Cody Gamble moves to 2-2. The fifth Liberty pitcher, Gamble retired two batters in the seventh to end a Lancers’ scoring threat. Longwood reliever Michael Catlin drops to 2-4. He gave up five runs on four hits over 1 1/3 innings. The third of six Lancers to pitch in the contest, the right-hander struck out four and walked three. Longwood pitchers walked 13. Liberty outhit Longwood, 16-14. The Lancers committed four errors, while the Flames made one. Up Next: Liberty and Longwood met again tomorrow at Bolding Stadium. First pitch is scheduled for 4 p.m.